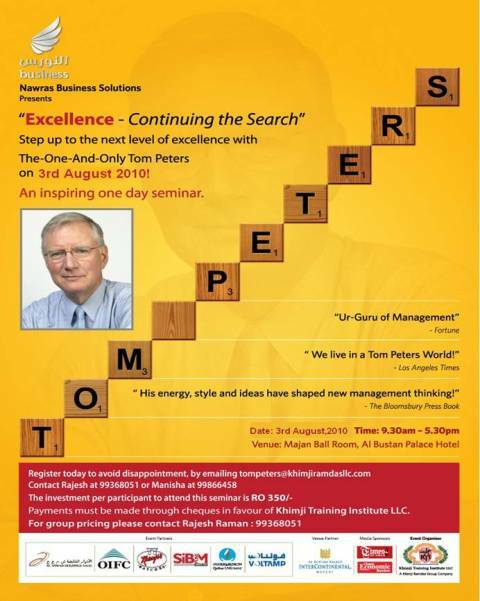 Management guru “Tom Peters” will today present an exclusive one day seminar “Excellence-Continuing the Search” at Al Bustan Palace Hotel. This one of a kind, hi-profile visit is organized by Khimji Training Institute. Tom peters is widely acclaimed to almost single-handedly “inventing” the “management guru industry,” now billions of dollars in size. In a career spanning more than 3 decades, he has given well over 2,500 speeches, flown 5,000,000+ miles, spoken before 2,000,000 to 3,000,000 people and presented in 48 states and 63 countries. Some of Tom Peters most famous works include, In Search of Excellence – 1982 (Ranked as the “greatest business book of all time” in a 2002 poll by Britain’s Bloomsbury Publishing) carry forward 2010 – The Little BIG Things: 163 Ways to Pursue EXCELLENCE, 2010, including The Essentials Series, on topics ranging from Leadership, Talent, Design, to The Circle of Innovation, and ‘SIXTY’ years of experience to name a few. Previous PostCelebrate Iftar on the Super luxury yacht, Loaloat Al BeharNext PostKhimji Ramdas Customer Care is just a call away!! Call us.. we are (a)waiting! !